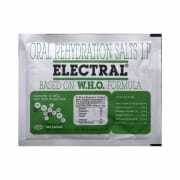 Electral is a WHO based ORS (Oral Rehydration Salt) formula. 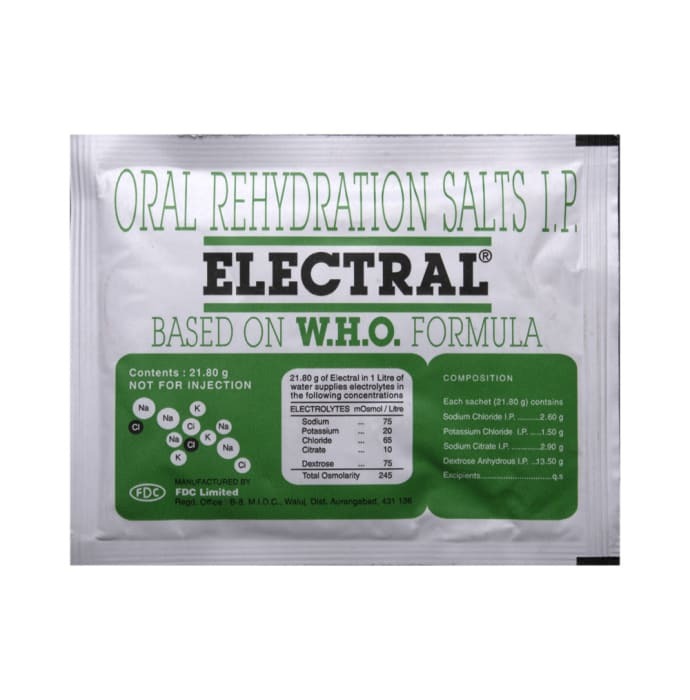 Oral redyration salt is a combination of Dextrose and a number of essential electrolytes (Sodium Chloride, Potassium Chloride, Sodium Citrate). Electral restores body fluids & electrolytes, lost due to dehydration in during Diarrhea, vomiting, muscle cramping, and exertional heat illness, while exercising in hot or humid weather. 1. Dissolve the contents of the packet in the amount of drinking water indicated on the packet, usually 1 litre. 2. If drinking water is not available, or if you are not sure the water is drinkable, boil the water for at least 10 minutes and then let cool. 3. Stir well, and give to the child to drink in a cup or spoon feed. Note: Be careful to mix the right amount of water. If you use too little water, the drink could make the diarrhoea worse. A licensed pharmacy from your nearest location will deliver Electral Powder. Once the pharmacy accepts your order, the details of the pharmacy will be shared with you. Acceptance of your order is based on the validity of your prescription and the availability of this medicine.